Who is SaskOrganics and what do we do? 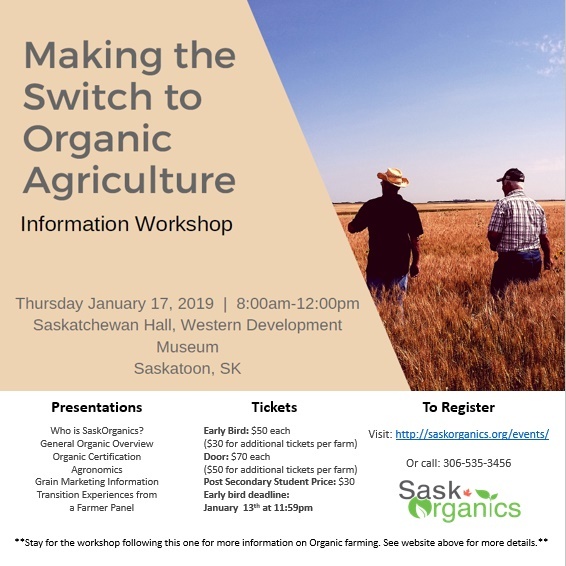 There are also resource materials available during the workshop, both free and for purchasing, that can help guide your Transition to Organic. If after the general overview, you are looking to delve deeper into some of the details of organic production, you may want to consider attending the workshop immediately following this one, in the same location: “Green Manure & Animal Manure” Production Workshop. If you register for both workshops, your lunch will be free. Visit our website for more details.